* All books contain post-consumer fibre. with new friends buzzing with excitement. 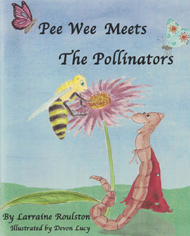 Pee Wee Meets The Pollinators,	follow this link. 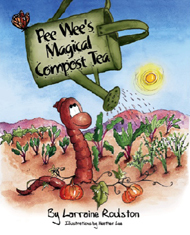 Through the adventures of Pee Wee, the endearing little red wiggler worm and all the insects in the compost heap, the first book introduces children to backyard composting. The series begins when four neighbourhood children are magically transported on the back of a butterfly to visit Castle Compost. 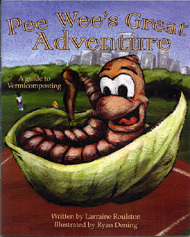 The book's sequel has Pee Wee describing an amazing adventure from a classroom worm bin to a backyard composter. Instructions are included on how to care for worms and harvest their castings. 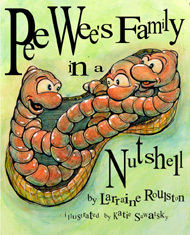 This story unites Pee Wee with cousin Reddy in a classroom worm bin. The book notes the differences between vermicomposting and backyard composting. Pee Wee and all the compost critters are taken to a Spring Environmental Science Fair where children display their elaborately decorated worm bin. For a Waste Reduction Week activity, students explore the benefits of brewing and applying compost tea. All the while, Pee Wee and the compost critters plan to host a compost tea party of their own, inside a rotting Jack O’Lantern. Pee Wee & cousin Reddy visit a school’s rooftop garden to learn about the amazing work of pollinators. During their adventure the two red wigglers witness the birth of a monarch butterfly, follow a bee and meet a chorus of crickets. The story also features composting, compost tea, vermicomposting and finished compost. 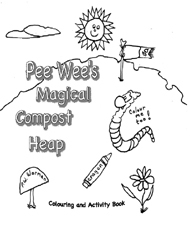 Pee Wee invites you to colour the entire book and solve the puzzles at Castle Compost. Twenty-four pages illustrate the joy of composting. Order all seven books and save! These fanciful stories blend fiction with facts. They include songs, poems and additional notes all designed to help teachers, parents and children discuss the process of composting in an interesting way. Each book can be purchased individually or all six books in the series and the colouring book can be purchased for $40.00. Discounts as well for bulk orders. Together they make a good environmental contribution to any library. All books contain post-consumer fibre. Also, please remember that postage is free within Canada and USA. 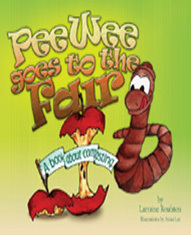 With the purchase of one or more books, the Pee Wee puppet show presentation on composting and my teacher's guide will be emailed upon request to interested environmental educators. www.compost.org - Compost Council of Canada - just one of the many composting councils around the world. www.bestbuyworms.com - Best Buy Worms - Composting worms. Vermicomposting supplies, the Worm Chalet and inspirational workshops. www.cityfarmer.info - City Farmer - News and information for urban agriculturalists. www.waikikiworm.com - Waikiki Worm Company - Resource Recovery Specialist & Educator. My six year old nephew was enthralled! It stirred his imagination (wishes he could shrink down to bug-size) and has my sister getting the composting going again. "They're funny, they have facts and they're cute!" Submitted by Mom (Consuelo H. - New York). As a freelance writer, Larraine Roulston has been writing on environmental issues since 1987 in community newspapers, magazines (BioCycle, Forever Young and Canadian Teacher) and is a regular blogger on Green-Mom.com. International Compost Awareness Week is celebrated annually the first week in May.